We spend a third of our lives sleeping. However, we spend our entire lives breathing. Okay, there may be some moments when you stop breathing while learning to swim, but if you don’t breathe for a while you will die. What you breathe is equally important to where you sleep. Lungs are one of the vital organs in your body and should be treated with care. In addition, if air pollutants harm your lungs, they can get into your circulatory system and damage every organ. Therefore, the best way to deal with indoor air pollution is to know the sources. 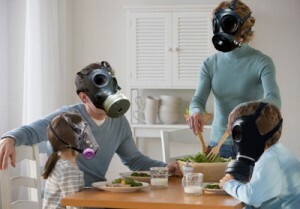 There are many kinds of indoor air pollutants. Here are four of the most common air pollutants. Radon is a colorless, odorless gas found everywhere in small amounts. Being exposed to high radon levels increases the risk of developing lung cancer. To prevent it, make sure your home is tested for contamination. If it is contaminated, call professionals immediately. Environmental tobacco smoke, or secondhand smoke, is one of the most common indoor air pollutants. In the short-term, being exposed to it can lead to irritation of the nose, eyes, and throat. In the long run, it may lead to many of the health problems of smoking, such as pneumonia, wheezing, lung cancer, and bronchitis. It may also trigger asthma attacks. To prevent it, do not smoke indoors and use good air cleaners. Mold is another of the indoor air pollutants. Some mold varieties are harmless and others are dangerous. Mold can cause allergic reactions in some people and cause symptoms such as nasal stuffiness, throat or eye infection, coughing or wheezing, swelling, or skin irritation. Severe reactions may cause difficulty in breathing and fever. It can cause asthma attacks as well. They key to dealing with mold is to keep the levels of moisture and humidity under control. Carbon monoxide (CO) is an invisible, odorless gas. It makes the body unable to use the oxygen it requires to function normally. It can cause tiredness, dizziness, headaches, confusion, nausea, and a fast heart-rate. A high level of carbon monoxide causes death. You should have your heating systems inspected annually by a professional. Ensure that combustion appliances like heaters are installed properly. Do not heat your house with a gas stove and make sure your combustion appliances have vents inside. Of course, there are many other examples of air pollutants. The most important thing to do is to identify them and take the necessary steps to prevent or get rid of them. Purify the air in your home by getting rid of air pollutants today.